Jon Rees is a Swansea-based Ripperologist, writer and speaker. Jack the Ripper gets everywhere – films, books, video games, TV shows and even comics. Yes – comics! One of Jack’s oddest (and briefest) comic appearances sees him pop up in issue 517 of British comic “2000 AD” in April 1987 when Jack the Ripper is transported to MegaCity One in the 22nd Century for reasons that are never properly explained. Judge Dredd is soon on the case and Jack is hunted down and killed within 6 pages. Take that Abberline! In an alternate universe where Batman existed in the 1880s, billionaire Bruce Wayne returns to Gotham from a trip to Europe, followed by Ripper like murders. A bloody knife is discovered in Wayne Manor and Batman must track down the real Ripper and prove his own innocence. This is quite a fun little story, but the motive does turn out to be a little cliché. 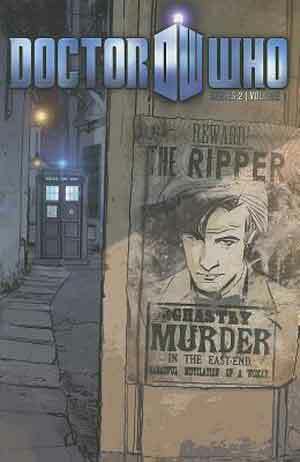 The second series of Eleventh Doctor graphic novels starts with a bang when the Tardis crew land in 1888 London and the Doctor is promptly accused of being Jack the Ripper. There follows a race against time to save Amy from becoming the final victim of Jack the Ripper. Considering the subject matter (Doctor Who, a family show) and that kids will want to buy the comic, this title is surprisingly dark in story and graphic (even with moments of humour such as the Doctor adopting the pseudonym “Inspector Clouseau”) and it does attempt to fit the Ripper mystery around the plot, rather than just “shoehorn” it in. Considering most American cop shows have a Jack the Ripper copycat episode, it’s quite surprising CSI hasn’t. But it did in comic form. Las Vegas is hosting a Jack the Ripper convention (think of a Star Trek convention, but with top hats and bodices instead of pointy ears and Klingons – honestly, the UK conferences are nothing like this) when a series of Jack the Ripper copycat killings begin. Grissom and the team must work out who of the delegates is responsible and stop them before they can kill again. Several current theories and researchers are name checked and it should be no surprise to anyone who has watched the show that Grissom is a Ripperologist. Plus also there are some rather stylistically nifty little flashbacks scenes to the original murders that makes this worth a look. The mother of all Jack the Ripper graphic novels and the (loose) inspiration for the Johnny Depp film, From Hell is a giant work – the size and weight of a brick! Told mostly from the Rippers perspective and extending to the influence the crimes had on the century that followed it is gory, brutal, pornographic and not for kids. 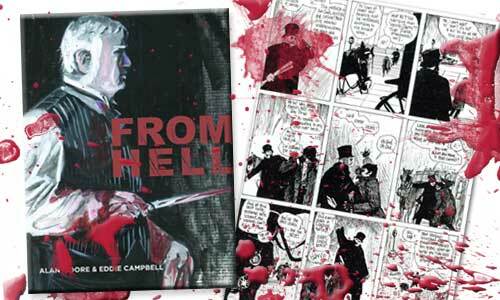 This is a must read for anyone interested in comics or Jack the Ripper, but not for the squeamish. There is also a nice little bonus comic at the end “Dance of the Gull Catchers” that charts 100 years of investigating the crimes. Alan Moore’s finest work. 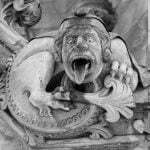 Read review of From Hell here.